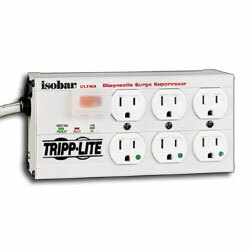 Tripp Lite's Isobar Hospital Grade 6 AC Outlet Ultra Diagnostic Surge Suppressor incorporates 6 AC outlets with their exclusive Sine Wave Tracking to closely monitor surges providing a consistent, high level of protection regardless of where the surge occurs on the waveform. Ideal for premium protection of medical network computers, healthcare equipment, nursing workstations, internetworking accessories, communications systems and other sensitive electronic devices in areas where hospital-grade plug and outlets are required. NOT FOR USE IN CRITICAL CARE AREAS!!!! !